People often ask, “Can you communicate intuitively with zoo or wild animals? Is it possible to have a non-verbal two-way conversation with a family pet?” The answer is yes! Our animal companions often make us smile by the way they communicate through a look, a touch, and other behaviors. Before language was created, it was the method by which all life communicated. Intuitive communication, which is also referred to as telepathic or psychic communication is not only a natural way of conversing, it's the manner in which all non-human life communicates. They talk, not on the Internet, but rather the Inner-net or Web of Life! In the Western Culture it's often a lost or latent human ability we’ve been taught to suppress and conditioned to forget. We're taught early, by society to believe intuitive communication is our over-active imagination at work. Sandra uses a method of communication called the CLARAC Approach in talking with animals. She explains this method in her soon to be released book, “Animal Conversing, the CLARAC Approach”. Each of the letters in word CLARAC represents a step in communicating with animals and nature. Because all life is connected, it is only a matter of tuning the channel to the correct receiver. Additionally, parents can use this approach with their pre-verbal infants and even babies in the womb. Sandra’s intention in creating this method is to help people connect with all life that does not speak speak the human language. Can I learn animal communication and verify the information I receive? In teaching her animal communication classes, Sandra creates interactive and verifiable exercises which allow students to surprise themselves with incredible intuitive hits. After connecting with animals on the Inner-net, not the Inter-net and receiving positive feedback, many students say, “How could I have known that?” Participants often work with live animals in the classroom which becomes a safe and supportive place to practice intuitive communication. It’s amazing to watch the transformation as we began the process. The animals that at first were excitable, will often sit or lie down quietly as the participants talk with them. Both humans and animals benefit from this experience. The participants often say they feel joyful knowing and experiencing this sacred link. The animals often express surprise and happiness that humans have finally heard them. In learning animal communication, our greatest task is to remember this connection as our sacred birthright. The classroom creates the opportunity to affirm human and animal communication, because the only separations we have are the illusions we create. For more information about Sandra, go to www.sandralarson.com. *Special thanks to Joan Hansen for the art work above. 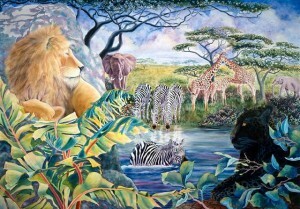 For more info on Joan Hansen and her Animal Art click the animal art link or visit www.joanhansenart.com. Sandra Larson was born in Superior Wisconsin. She grew up in a nurturing home with caring parents and three close sisters. She graduated from the University Wisconsin-Superior (UWS) with a double major in Psychology and Education. In addition, she graduated from Gateway College Florissant, Missouri. Sandra taught elementary school in Wisconsin, Germany and California. She was a Psychology instructor at both Wisconsin Indianhead Technical College (WITC) and San Diego Community College (SDCC). While in California, Sandra created Sandra Larson Seminars and worked as corporate trainer for Impac. She became the Regional Sales Manager for Lieba, Inc., and created her own business promoting products at trade shows across the United States, Canada and Europe. She returned to Superior and experienced a successful career in real estate with RE/MAX Twin Ports. She returned to UWS and received her Masters in Counseling (MSE). She went on to study life coaching with Coaches Training Institute (CTI), became a certified Soul Coach & Past Life Coach with Denise Linn, and an Angel Therapy Practitioner™ (ATP) with Doreen Virtue. Through her training with MaDonna Kettler, she became a certified Trans-personal Clinical and Master Hypnotist, including training in the Life Between Life (LBL) program. She has studied with Mary Stoffel and Kim Luetke and completed the Professional Series Course with international animal communicator Marta Williams author of Learning Their Language and Beyond Words. Sandra currently has an Animal Communication and Soul Coaching Practice in Little Elm, Texas.